Today is the first day of summer. If you’re anything like us, you are already daydreaming of days spent on the beach, on the lake or near (or in) the pool, as well as nights spent patio-lounging with your friends. Yet nothing says summer like a good old-fashioned barbecue. These casual, fun and often shoes-and-shirt-optional outdoor events are typically filled with ice cold beverages and piping hot grilled goodies—whether it’s burgers, hot dogs or fancier fare, like skewers and steaks. The key to a good summer barbecue is as much about the company you keep, as it is about the grilled goodies you serve. 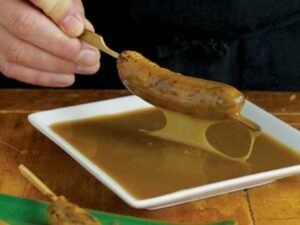 If you want to turn your barbecue bonanzas up a notch at home, it’s time to start collecting recipes that can please the diverse palates of your guests. To start your summer barbecue schedule off on the right note, we’ve collected a few of our favorite summer grilling recipes that are sure to please every palate. Whether it’s grilled veggies, salmon or fruit, these dishes will make you toast of the barbecue circuit. Grilled vegetables sound so basic, but they are so far from it. A mix of peppers, squash, Japanese eggplant, and a few other veggies can be a satisfying side dish or—cook up some brown rice on the side—and you’ll have a lovely vegan dinner. This recipe from Giada De Laurentiis adds a drizzle of herbs, oil and balsamic vinegar for a seriously delicious dish. If you live in California, then odds are you’re a fan of fajitas. So, why not put a Mexi twist on the kebab? 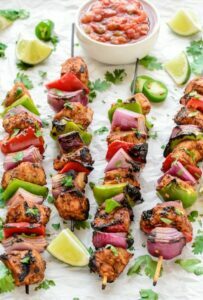 This juicy, flavorful skewer recipe from Well Plated is the perfect solution. 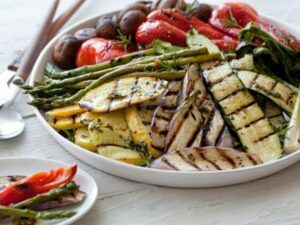 Pair it with the grilled summer veggies from above, and you’ll have the ultimate healthy BBQ recipe to share with your buds all summer long. There is nothing more all-American than a hot dog. 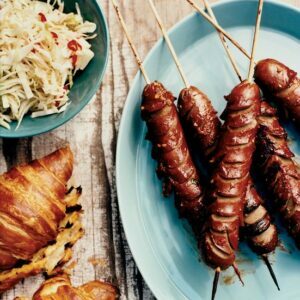 These sweet-savory glazed hot dogs — inspired by a dish Marcia Kiesel discovered at a Manhattan Chinatown restaurant and printed in Food & Wine —are cut in a crosshatch pattern, which makes the franks cook even faster. Elevate the sophistication of your dogs with a mustard-brushed croissant. Yum! 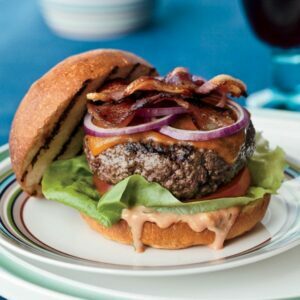 Burgers are a BBQ’s BFF and we all know it. You can go traditional and just throw in some spices and grill it up with all the fixings or you can go a little fancier (and more decadent) and take a lesson from Chef Laurent Tourondel from BLT Burger in Las Vegas with his Cheddar BLT Burger with Tarragon Russian Dressing. This burger is overflowing with butter, bacon, and cheese—so you may want to have some of those grilled vegetables on the side to even the health score. We’ll admit it: sometimes the idea of eating a heavy burger when it’s 100+ degrees outside is about as appealing as a hot bowl of soup. 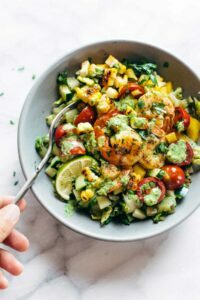 This cool detox salad recipe from Pinch of Yum, made with avocados, cucumbers, tomatoes, bell peppers, grilled corn and romaine and some skewered shrimp, may be the answer you’ve been looking for; it’s light, refreshing and oh-so healthy. Between the herbs and the citrus-based dressing, you’ll be well on your way to maintaining your summer glow. Salmon doesn’t need much to make it delicious—a little brush of butter and lemon juice makes a delectable dish. 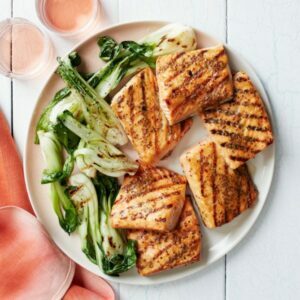 But if you want to appear a touch more BBQ posh, try this simple Honey-Mustard Salmon recipe from Boston-based chef Jamie Bissonnette. It’s healthy, light, and pure summer. Give the vegetarians in your life a much-wanted reprieve from the obligatory veggie burger with this grilled tofu steak recipe from Food & Wine. The beauty of using firm tofu is that it holds up beautifully on the grill (and gets nice and smoky). 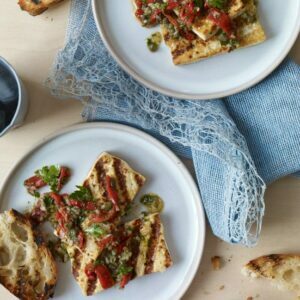 Pair with tangy salsa made with piquillo peppers, capers and parsley, and you’ve got yourself a winning plant-based dish. Shrimp is divine on the BBQ and there are hundreds of ways to prepare it—it all just depends on what your taste buds are craving. 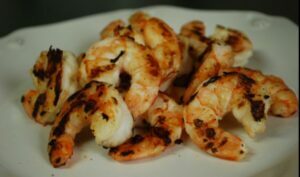 This Tequila Shrimp recipe from domestic maven Martha Stewart serves up a summer treat with a great little kick. 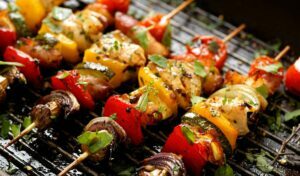 Grill it up as an appetizer for an after-beach barbecue or have it as a main course with a light side dish like Orzo Salad. This simple grilled turkey burger recipe published by Food & Wine and created by Bobby Flay gives non-red-meat-eaters something to be excited about. Instead of tried-and-true cheddar or American, melt slices of smoky Gouda cheese onto the meat. 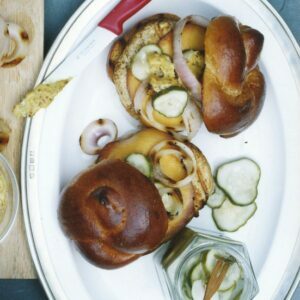 Then spread toasted Brioche buns with a sweet-spicy sauce of mustard, horseradish and honey. It’s turkey burger bliss! No barbecue is complete without dessert. Yes, you could roast some marshmallows over the grill and make s’mores or you could just grab some popsicles from the freezer. But if you’re in the mood for something sinfully different, try some bananas or pineapple hot off the grill. This Grilled Banana recipe is a great place to start—so start peeling those ‘nanas and dig in.